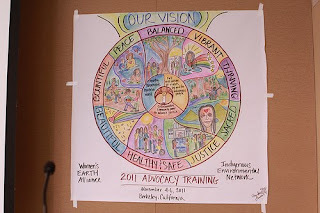 This November 4th – 6th, WEA hosted our first Advocacy Training, in partnership with Indigenous Environmental Network. We’re proud to share that the Training was a success. 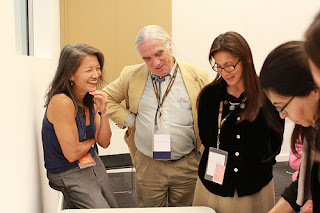 Our Training took place at the David Brower Center in Berkeley, CA, which is located on Ohlone territory. Muwekma Ohlone elder Ann Marie Sayers opened the Training on Friday morning with a welcome and blessing. Over the course of these three packed days, participants formed new partnerships, shared intensive dialogue, and learned key tools and strategies for advancing environmental justice with Indigenous peoples. The Training also yielded several mandates for WEA’s integral forward motion, as we continue deepening our relationships and our legal and policy advocacy work for environmental justice in collaboration with grassroots Indigenous women leaders. The Training engaged approximately 35 advocates as new members of the WEA Advocacy Network – a great boon to the stability and longevity of our work. Participants were almost entirely advocates who were not previously involved in the Advocacy Network. Our participants came from all over the United States, representing some of the following organizations: Center for Biological Diversity; Earthjustice; International Accountability Project; NAACP; Three Degrees Project; University of Denver Environmental Law Clinic; and many more. I just wanted to extend some gratitude for having the opportunity to take part in such an enriching and wonderful event. I left the training forever changed. I look forward to being part of the vibrant and wonderful advocacy network and also continuing to take part in the other elements of WEA. We were honored by participation and presentations from representatives from 18 Indigenous-led groups, and 7 non-Indigenous groups with a history of strong alliances with Indigenous peoples. Presenters and facilitators provided critical, foundational knowledge to participants on the process of building successful alliances, tools and strategies for success, and current needs for legal and policy advocacy support. As a Native person, a practitioner, and an attorney, I found it very inspiring and helpful to strategize in a way that’s real and that’s culturally grounded – this is something very rare, and has given me a lot of hope for the work that I do. Many of the Indigenous groups represented at the Training, as well as several others, shared requests for advocacy collaboration through our docket. Already, first-level discussions have been initiated towards 11 collaborations between grassroots Indigenous activists, with the legal and policy advocates who participated. Please stay tuned for more details about the specific advocacy initiatives that arise from the Training, and the next steps for WEA’s North America program. Thanks to WEA's organizational partner, Indigenous Environmental Network; Steering Committee members - including Jihan Gearon (Dine') of Black Mesa Water Coalition, Debra Harry (Kooyooe Dukaddo) of Indigenous Peoples' Council on Biocolonialism, Winona LaDuke (Anishinaabe) of Honor the Earth, Toby McLeod of Sacred Land Film Project, Tia Oros Peters (Zuni) of Seventh Generation Fund, Carolyn Raffensperger of Science and Environmental Health Network; our lead facilitator Roberto Vargas, all the WEA staff and volunteers who produced the Training, all those who contributed financial resources towards the Training, and most of all, everyone who attended and gave so much of themselves towards the success of our first Advocacy Training.